You've found the “U.S. 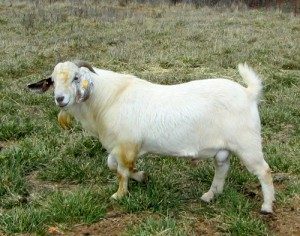 Savanna Goat Breeders” page here at Hobby Farm Wisdom! If this is the first time you have visited our site: Welcome! Originating in Africa, Savannas are stellar meat goats. They produce abundant, mild-tasting meat and are very hardy and low maintenance. These goats have large, muscular bodies with does weighing between 125-200 lbs and bucks 200-250+ lbs. Some bucks have supple skin folds on their chests. Their horns are strong, wide and medium sized, curving straight back. They have short, white coats with some colored sprinkling, and with black skin, horns, nose, and hooves. Savanna bucks can be aggressive breeders and does are very protective mothers. Does are fertile, have birthing ease and usually birth 2-4 kids per litter. They breed yearly and are used to foraging in harsh environments. They can endure heat and sunshine or cold and rain, are disease resistance and rarely have problems with their hooves.